It is amazing to think we are already into February...and I am still spinning! I had my hardest class last Thursday. Lots of intervals with increasing resistance. We started hard and seemed to keep getting more intense for the duration. I felt woozy by the end. But I stuck with it and was proud of myself! 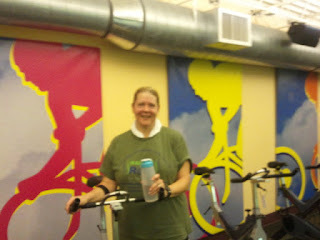 I thought I would show a "cute" photo of myself after the class (nicely taken by my instructor)...still standing!